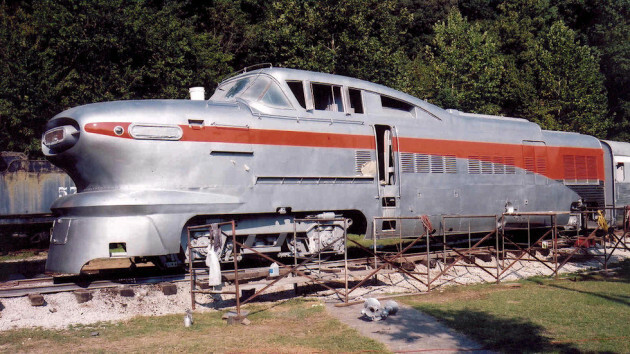 The cosmetic restoration of the historically significant Aerotrain in the collection of the St. Louis Museum of Transportation is well underway. This project was funded by a donation from the Gateway Division NMRA. In the photo provided by the Museum of Transportation – St. Louis (transportmuseumassociation.org), you can see the results of the many small repairs, new silver paint, and the application of the stripe. Although the restoration can’t make it run again (as the Rock Island kept the diesel engine, traction motors, and everything else they could use before donating the shell of the locomotive and two cars from the 10 car train to the Museum), it will make it look like it did when it ran on the Rock Island in Chicago commuter service. This photo was taken about September 15, 2003. The Museum has made additional progress since then, starting restoration on the cars and attaching the front number on the loco. For information on this, and other, restoration projects in progress, visit http://transportmuseumassociation.org/.